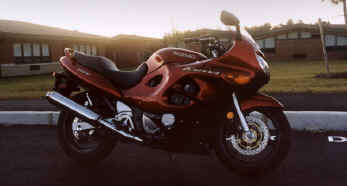 Got a new Suzuki Katana 750 motorcycle for the millennium. It's a maroon 2000 model. To the left here is a picture of the new wheels at my old grade school in Sterling, MA. All year, the only thing I had been thinking about was getting a new motorcycle. So here it is. My friends will be glad that I can stop sending them the tired old picture of this bike from the Suzuki website. Here's an action shot from my Dad. Universal rendezvous point - Bradlees parking lot. Some other people were meeting a few rows over. Ray's got style... and a Miata. For Easter, I parked in front of a church and took a picture. Then I cropped the church out. Sorry Jesus. If you look close, you can see the boat club behind there. Sunset on the Hudson Not sure what the sign back there says.. no parking on the grass maybe. First day back to work on the new bike. Out for a ride by the Hudson River in New York. Me and Chris at Ray's. There's Chris and Ray in the background with the Chris Mobile. The 2000 Katana and the 2000 Corvette. Brett's corvette is filled to the brim with extras, everything except the HUD. My bike parked on top of where the old Houghton school 8th grade wing used to be. What kind of person would park across two handicapped parking spaces? Here's my bike and Brett's vette. Here's my bike with MIG and his red BMW 328i. Of course my motorcycle is more red than his beamer.